'Speed Mate - Happy Auto Life'. So declares an illuminated sign on the forecourt of a petrol station not far from my hotel here in Incheon. Sightings such as these have been amusing this slightly jet-lagged traveller today after the 10 hour flight up from Sydney. 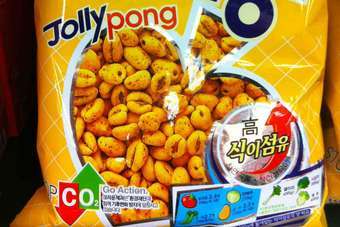 And how could I resist purchasing a packet of Jolly Pong in Lotte Mart, a supermarket? Especially when a slogan implores the purchaser of this bright yellow snack to 'Stop CO2. Go Action'. Yes it's a bit unfair of me to make fun of Korean English, especially when I have yet again fallen for this country on what is now my second visit. The people are a big part of what makes me love it: with no ability to read Hangul I was nonetheless aided by several supremely helpful sales assistants in Lotte Mart in my quest to buy vegetarian-friendly food. I have been bowed to and beamed at in shops, hotels and cafes. And how about this: returning me to Incheon airport after my stay here a few weeks back, the hotel's courtesy bus driver sprang from his seat and ran to fetch me a trolley for my suitcase. He even looked embarrassed when I insisted on tipping him. The giant airport here is a lesson in efficiency, clarity of lay-out and intelligent design - Heathrow's Terminal 5 had been my favourite major hub until now (I refuse to group it with the tatty Terminals 2, 3 and 4, while I have rejoiced to see the wrecking ball recently put through the even more ghastly and ramshackle Terminal 1) - it's even quite beautiful to look at as you come in over the Yellow Sea. Incheon itself is a fascinating place. The car-spotter in me is being treated to some terrific sights but I will blog about that separately. No, it's other reasons, such as the slightly unsettling sight of soldiers in the supermarket (perhaps they were stocking up on Jolly Pong). In South Korea, military service is compulsory for males. And if you choose to be a conscientious objector? Well then it's off to jail with you. It's a sobering thought to realise that there are reportedly some 1,000 missiles pointed at the part of the country where I am right now, including Seoul, which is about 70km to the east of Incheon. Someone who told me how he himself avoided military service was the passenger beside me on Korean Air from Sydney yesterday. Born here, he moved to Australia with his mother when only five years old, his dad having gone ahead first. The father, forced to help break up a demonstration which involved beating families which included children, decided he could take no further part in such brutal duties and left the then military-ruled South Korea. It's worth remembering that this now democratic, peaceful and prosperous nation was mostly a thugocracy throughout the 1960s, 1970s and 1980s. My new friend, the 20-something Korean-born Australian son (quite an interesting guy - he has since left Sydney to live in Tokyo) had to go through a long process to avoid being drafted on his 18th birthday or even arrested should he have come here to visit relatives. He maintains that just as was the case with Germany, the Koreas will be eventually reunited, that family ties are too strong for the two countries not to at some point come together again. He also reckons that while South Koreans might grumble about a reunification tax which president Lee Myung-bak seems determined to soon impose upon them, they seem resigned to it. Like military service, he notes, people will accept it as it would be "in the national interest". Sadly I won't have time on this brief trip to visit the Peace Observatory on Ganghwa Island just north of where I am staying. Here, you can view North Korea from a distance of one mile at a US military-controlled checkpoint. But it's close to the top of my must-do list the next time I stay in this part of South Korea.